I’m sure you’ve heard about him. Sudan was put to sleep on Monday. He was old and it was his time to leave us. His death was painful though, not just for me but for many other caring humans. I’ve been following him and his family for quite some time now. Ever since I found out about Suni, the 2nd to last male, who died in 2014. The image above is of a Southern White Rhino, NOT the Northern White. There are about 20,000 left of this subspecies which is considered ‘Near Threatened’ according to the IUCN Red List Classification. What’s inspiring though is that in the early 1900s, there were only 50-100 left in the wild, so that’s good news, but still, it would be better if no animal were to land on the IUCN Red List at all. I had the pleasure to visit the Plettenberg Game Reserve in South Africa through my work with Safari With Us, an ethical tour operator located in Johannesburg. It was the last stretch of my family’s 3-week tour of South Africa, Botswana and Victoria Falls in Zimbabwe and I hadn’t seen any rhinos yet. Knowing about their fate by poacher’s hands, I felt an enormous surge of hope when I spotted them. Tears streamed down my face as the driver looked in his back mirror and said, ‘I think someone’s very happy.’ He knew all I wanted was to see rhinos in their natural habitat, free of fear. Of course, rangers were near to protect them in that reserve, because poachers are everywhere and have the GPS technology to locate their prey and quickly kill rhinos for their rhino horn and elephants for their tusks. 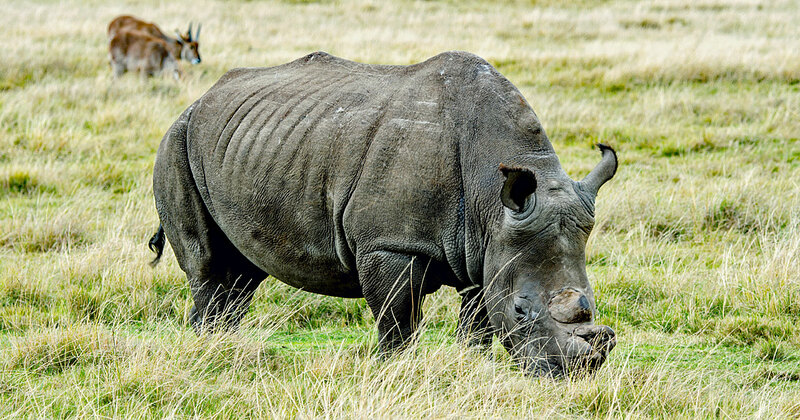 What’s up with Rhino Horn Anyway? Rhino horn is sold in a few Asian countries because the myth is that rhino horn, when broken down into a powder, can cure cancer and act as an aphrodisiac or a hallucinogen. It’s also considered a symbol of wealth. The reality though is that rhino horn is made of keratin, the same stuff our nails are made of. So, anyone who believes rhino horn is magic should just bite their nails if they want to get healthy, horny or high. I’m sorry for being sarcastic, but it’s unacceptable for us to drive a beautiful species into extinction for absolutely no reason. 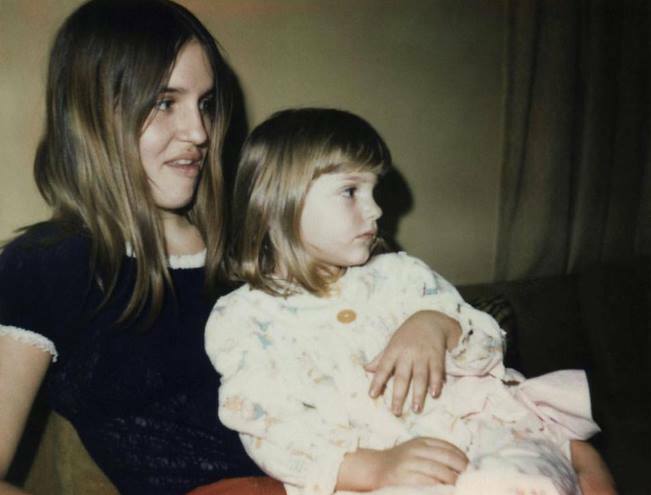 My mom holding me in 1972. She was only 22. Not only did we lose Sudan, I’m still mourning my mom’s death. She passed away at the age of 66 on July 20, 2016, the same day we arrived in Johannesburg to start our 3-week tour in Southern Africa. I stayed on that trip because it was her wish. She knew she was going to die, but didn’t tell us. She had a cavernoma close to her optic nerve, but not in her brain that was surgically removed one week before my trip and survived that harsh surgery and we thought all was good, but it wasn’t. She had a pulmonary embolus and didn’t make it. On the flight home, I wrote about her death and my grief during that trip and submitted it directly to the Arianna Huffington of The Huffington Post. She wrote back and immediately gave me access to become a contributor. She also mentioned that it was her last day at The Huff Post because she founded, Thrive Global, of which I’m also a contributor. I’ve never had contact with her before, but this just proves how amazing this woman is. She’s a celebrity, but took the time to write me in my time of grief. Maybe because she felt her own grief when she lost her mother several years ago and wrote about her profound passing. But from what I’ve heard from others, that’s just how Arianna is – a beautiful woman who cares deeply for the well-being of others. The reason why I’m writing this today though is that today, March 23, is my mom’s birthday. She – and my dad who passed away on August 8, 2017 at the age of 65 – taught me to respect Mother Nature and all she takes care of. I grew up in a household of rescues. To this day, I take spiders outside, either that or just leave them where they are. If they’re too big, I call my husband to take them outside. They deserve to live a safe and happy life, just like we do. It’s our responsibility to respect Mother Nature and all she takes care of. It’s our obligation to stop harming animals and forcing precious species into extinction. I deeply apologize for your suffering. Throughout time, we have shown how easily we can drive entire species into extinction. We were given this power and have taken it for granted. Although you have shown us time and time again via natural disasters how upset you are about our destructive ways, we still haven’t stopped harming animals (humans included) and our environment. The unnecessary torture continues. I don’t know what to say except that I am truly sorry and hope that we can collectively help turn things around and make real changes in this world. We respect and love you and want you to thrive. Please forgive us and give us the strength and power to help you heal. 1) Help ethical brand owners market their incredible business so that they can make positive changes in their industry. In order to heal Mother Nature and our planet Earth, we have to support the good guys. They have to thrive! 3) I’m also now a vegan because I can’t support any animal cruelty, so I don’t eat or wear animals. I’m not perfect though and take meds when I need them which are tested on animals, but that’s why I’m a member of Ärzte Gegen Tierversuche e.V. (Doctors Against Animal Experiments), a German organization with the sole purpose of stopping the cruel and many times, useless animal experiments in the medical field. Think before you buy! As a consumer, you have a choice. You can either shop consciously or not. Every dollar/euro you spend says a lot about the world you want to live in. If you care about endangered species, child labor, your own health and the health of others, then make sure you know how stuff is made before you buy it. Do your research. The more you support horrible industry practices, the more harm will be done and your grandchildren will pay an even higher price than you. If you need help in finding an ethical brand, please contact me. I can help you find one you’d be more than happy to support! I have talked about how much of a pain it is to shop consciously, but I strongly believe that if more people are mindful about their shopping habits and if ethical brand owners continue doing good, the bad industry practices will fade away. Through my work at Ethical Brand Marketing, I’ve met a lot of amazing people who are trying to make positive changes in their industries. People who care about our lovely planet Earth and every living being who inhabits it. They make sure their materials and ingredients are ethically sourced and healthy, not toxic. They put great care into their employee’s welfare and believe in the value of Fairtrade. They also see to it that no animals are harmed in the process. This is the world I want to live in. This is the way life SHOULD be! Humans are not here on this Earth to conquer and destroy, although we’re doing a pretty good job of it. So, which side are you on? Do you want to live in a peaceful and ethical world or do you want to continue conquering and destroying it? It’s your choice. Do you also have a heart for animals? How are you helping heal Mother Nature? Please comment below and let’s talk !